Vince Gross Concrete driveways are built in nearly every shape and orientation available. Additionally, we’ll handle the planning, design, grading and pouring of the product, including any textured finishes. While concrete is more expensive than asphalt, it’s a sturdier material that will last longer and require less maintenance than gravel or asphalt. Additionally, a concrete driveway will add lasting value to your home in terms of appeal and appearance, contributing to your home’s resale value. Many concrete driveways, sidewalks and walkways last for 30 years or more without major maintenance. Cracks shouldn’t occur due to the presence of carefully-placed joints. Joints are simply planned cracks in the concrete slabs that allow for movement, such as settling, thawing or freezing, so that the slabs themselves don’t crack. Vince Gross Concrete will apply a high-quality penetrating sealer to your driveway, patio or walkway to help protect it from moisture, chemicals and stains. Concrete driveways boost the resale value of your home when compared to alternatives like asphalt or gravel. In this case, the gravel driveway was replaced with smooth, crack-free concrete slabs that are virtually maintenance-free and can stand up to the ever-changing Akron, Ohio weather. These homeowners in Uniontown, OH chose Vince Gross Concrete to pour their new concrete driveway. A soft finish and smooth jointing creates a virtually maintenance-free addition to this home. New Residential Driveways, Patios and Floors. For 29 years, contractors and builders have chosen Vince Gross Concrete of Akron, Ohio to plot, grade and pour new residential driveways, patios and garage floors. Our expert knowledge stands the test of time - a concrete build from Vince Gross ensures that your new construction's charm lasts for decades. 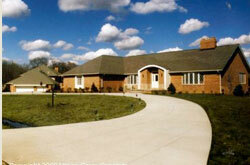 Vince Gross Concrete driveways are built in nearly every shape and orientation available. Additionally, we'll handle the planning, design, grading and pouring of the product, including any textured finishes.